MX apparel on and off the Motobike dust track. Safety Standards of MX Apparel. Perhaps nothing brings home the significance of MX apparel safety standards than the requirement by many tracks to wear appropriate safety gear when riding. Some people do not like to hear the statement about selecting gear as if your life depends on it, but it is very true. Even the best gear in the world does not prevent injury or death in some situations, but it definitely reduces the chance of any problem. 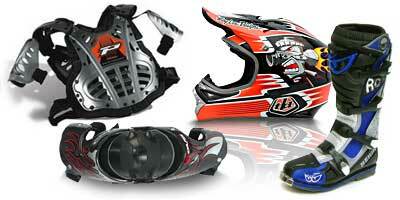 Each item has its own specific guidelines, including the basic vital gear of boots, goggles, gloves and a helmet. The price of MX boots is enough to make a person shudder, particularly parents of growing children that are trying to get all the necessities for their motocross kid. Confirm the boots will protect shins, ankles, feet and calves and that they fit. Leather is the material of choice, with protective plastic plates and durable soles. Look to see if replacement soles are available, since that keeps the boots usable for a longer period of time. Cheap is acceptable as long as the boots meet safety standards. Fit is far more important than price when selecting riding gloves. Quality FOX motocross gloves cost between $21 and $50 and even better deals are found online due to closeout or factory specials. Good palm protection protects skin during slides. Improper fit results in bunching and pinching, which can affect the way you handle the bike. Motocross helmet safety standards avoid cheap. Protecting the head and face from injury during impact reduces injury. The sun visor and opening for goggles do the same. Debris and rocks are deflected by the chin area, elongated for just that reason. Get a snug helmet with DOT and Snell certification. Since goggles protect your eyes from debris, they should fit properly on your face and with your helmet. Some ventilation is required so they do not fog up while you are riding. If you can afford the anti-fog treated lenses and tear-offs, those are features that are nice to have with the MX apparel you choose. Why high quality? And what is apparel? MX apparel by its very nature comes in all shapes and sizes. There is casual clothing for the street and proper dirt bike clothing for the track. Manufacturers usually offer high quality such as shift & fox, but be aware there is some cheaper non-branded gear out there for the budget minded. 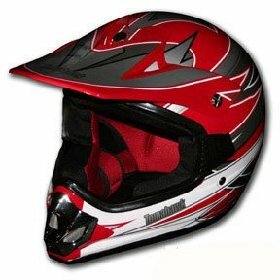 If your riding a proper dirt bike, then you will need to buy high quality helmets - no doubt about it. Don’t stint on cost as only the best will do - you will need a tuff helmet when racing hard with your buddies. Arai and Shoei are two brands that offer very good MX helmets. So if your riding an aprilia, a famous KTM or a Honda; apparel is so critical. Jeans and a T dont cut it. What is mx apparel? Well anything from motorcycle jerseys right down to boots and everything in between. When you’re on a new trail cutting up the mud on your motocycle, you don’t need just incredible skills you need clothing that’s been designed for the sole purpose of doing this sport and to keep you comfortable. The outdoors can rip-up your casual wear, and some motocross apparel is cheaper than tearing those expensive jeans in two – especially if you find a closeout sale online. Lets check out the trade on the web, to see what buys and clothing we can find for your bodies. 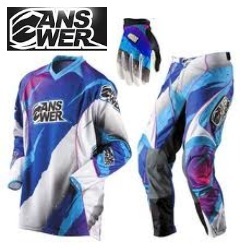 Mxdirtrider.com has a lot of stuff for dirt bike races, like a set of Answer Racing Men's combo’s. The deal on this was $130.37. The Ion Jersey was constructed from birdseye mesh performance fabrics, with Lycra micro cuffs and fade-free graphics. The Pants have Spandex panels to help the rider move with the energy and flow of a race. Plus a quick-lok ratchet buckle system & side waist adjusters keep them fitted to your legs. The pants are built from premium nylon and polyester which breathe with your body. The Answer Racing Women's WMX combo set came in at $130.37. Which offers some protection from dirt bike scrapes. The Jersey, has interlocking performance fabrics, multi-panelled self-fabric collar, and lycra micro cuffs. The Answer WMX Pants, have the same features as the mens combo kit, with pre-shaped knees & a 30mm waistband - and is of course cut for a female body. A cool set of mx apparel for any girl rider. Slyfoxmx.com came next, which has all kinds of things from sunglasses & goggles to all terrain gear for kids, men and women -ie: mx apparel for everybody! We enjoyed looking at a Thor Phase Motocross Combo on sale at $138.47. This kit is ideal for a learning environment or a full-on race day. Ok so what are the features? The Jersey has padded elbows, no-fade graphics and is made from a polyester, micromesh construction. Pants are 4820 Nylon, with ballistic knee panels and spandura areas for ease of movement on those quick off road motocycles. 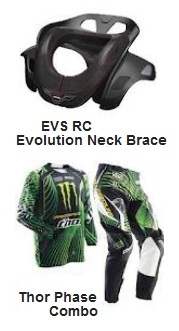 Although slyfox don’t have complete motorcycles for sale; you can buy items like an EVS RC Evolution Motocross Neck Collar for $169.99 or how about a One Industries Rockstar Freestar Teeshirt on sale at a cheaper $18.95. They too sell mx apparel for female riders. We found an Answer Women's MX Combo going for $115.95. The pants had a super-ratchet high-speed buckle system, and the new pre-curved, contour knees panels. Plus the ladies MotoX Jersey, has fade free graphics, non-restrictive collar and sublimated graphics in a number of popular choices. In this gear you’d look great on any bike at the starting gates. Last along is getgeared.co.uk as they have a dedicated Motocross Clothing and mx apparel section. We found a MADHEAD S9P motocross shirt. Which stands up to most punishment, due to its lightness and rugged build. All for £34.99, the shirt is given a generous cut for ease of movement, to help you ride the tracks in comfort. Some MADHEAD MX pants came in at £79.99. With a flexible jersey priced to sell at a give-away figure of £49.99. The store at getgeared is massive, where motocycle boots and hjc helmets can ALL be purchased - and a lot more besides. It's nice to be soaking up the dusty terrain on your race motorbike, but you will never find a clean environment to ride; so apparel like this will protect your body from the mud splatters and dirt debris. If you do spend out on motocycles keep some cash back for your mx apparel (it’s critical that you do). You only want to bring back funny motorbike stories from your last bike trip – not injuries. The helmet, chest protectors and boots should be of the best quality you can afford. The helmet especially should have passed all the minimum safety requirements (such as dot and snell). Unfortunately you will see your money decline, once you start splashing the cash on good mx apparel. But if you’re a bargain hunter and buy some cheaper items along with the expensive must-have accessories; overall you will be surprised by how much money you can save. Don’t skimp on the helmet however that’s one of your must-have’s – and have it new.